Planning on selling your home? Well, since most homeowners aren’t in the real estate business for a living, they usually have a few questions about selling. The way to get answers is to know what to ask and to become informed. There are so many variables that come into selling your home effectively. Being the best informed home seller that you can be could mean the difference from your home going stale on the market with no offers to selling for the most profit in a short amount of time. 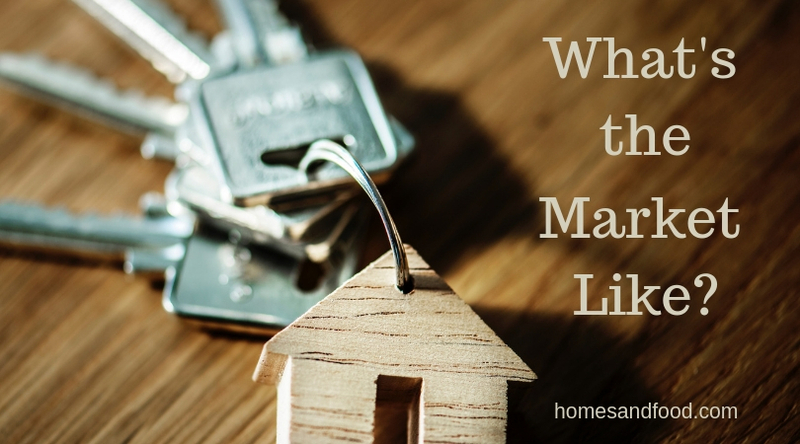 Below you’re going to find a list of some of the biggest market considerations to take action on before listing your home. This is a loaded question because timing has a lot to do with your local market. Some areas of the country don’t have a “down season” at all with steady home sales all year long. We see this a lot in warmer, tourist driven areas. This is the case where I sell homes. 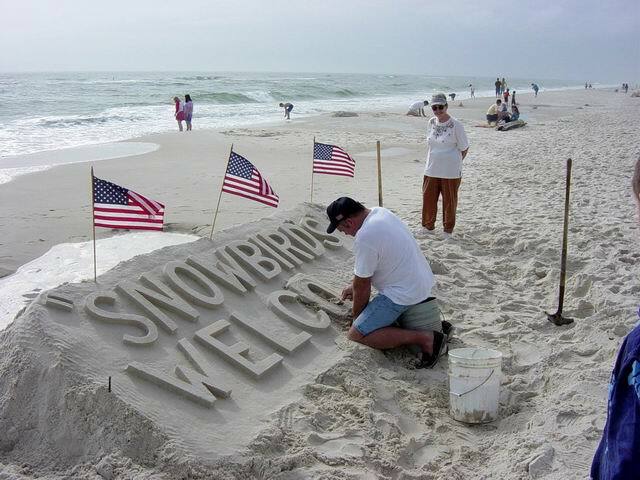 Buyers are often investors who want to capitalize on rental income from tourists and then there are the snowbirds. There are many northerners who, after visiting a southern town during the winter several times, decide to live there full time. For the rest of the country, sales do tend to slow down during the cooler months and amp back up starting in the spring and summer. One of the biggest reasons for the slow down comes from families with children. They simply don’t want to disrupt the school year for their kids which could be quite stressful for everyone. So when it comes to getting the right timing to sell your home, look at your own real estate market. Find out from a local Realtor which months tend to have more activity than others. One of the best ways to become an informed home seller is to look at your competition (other homes that are currently on the market). Despite what you think your home is worth, we are all at the mercy of other home prices in the area. For instance, if you think that your home would sell for $250,000 but 3 other properties in your neighborhood are listed between $225,000 to $240,000, you may have a problem. Buyers will naturally gravitate towards the lower priced comparable homes. Yes, you may have some upgrades that these other homes don’t have but it’s a great idea to examine your criteria to determine the right list price. In today’s digital world it’s easy to gather list price information for other properties in your area but there’s more. Your competition will eventually go under contract so you also have to find out what the final selling price was. The best and fastest way to get the final selling prices of homes that have sold is to ask your local Realtor. At the end of the day, home buyers are the only people who determine home value. One of the easiest things for a seller to do is to overestimate the value of their own possessions while wildly underestimating the value of their neighbors possessions. Most of us have some sort of pride of ownership (at least in our own minds) and believe that our home is better, more appealing, and generally more awesome than the house down the street. To be the best informed seller, you need to come to the conclusion that you have to be realistic about price. If, for instance, the home down the street has granite countertops and yours are laminate, you have to take that into consideration when pricing your home. This is the time to be objective whether you like it or not. Take a look at your competitors prices and what their homes have to offer. Think like a buyer and analyze every aspect of your home. Compare square feet, the number of bedrooms, and baths. Does the size of your lot compare to theirs? Is it fenced? How does their flooring compare to yours? It’s ok not to have nicer furnishings than your neighbors but just remember to take that into consideration when establishing a list price. The optimal list price is one that maximizes profit while minimizing time on the market. This is key to selling your home faster than your neighbors. What Makes Your House Stand Out? On the other hand, the opposite may be true. There may be attributes of your home that out shine the others that are for sale. As long as these attributes are fixtures and not personal property, you may be able to increase your price above the competition. What aspects of your home would make buyers want to pay just a little bit more for your property than the home down the street? You may have an in-ground sprinkler system or a tank-less water heater. You may have an in-ground pool and the house down the street may have an above ground pool. Your showers might be tiled instead of an insert. There are many aspects of your home that can raise or lower your initial price – just be objective. 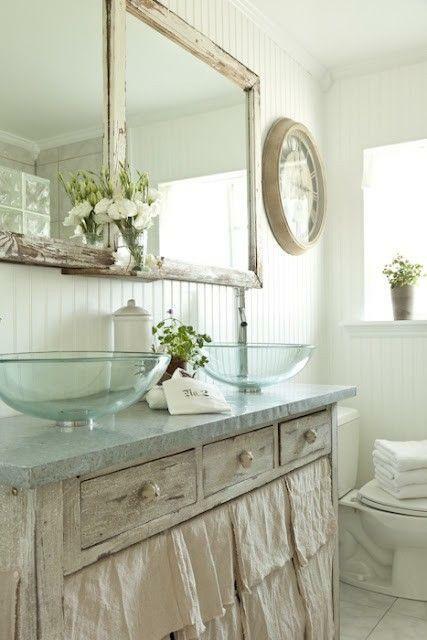 Kitchens and baths, by the way, are extremely important to buyers so if they stand out, that’s a major plus. How’s the Local Job Market and Economy? Having a good grasp of the local economy will help you with timing and pricing. For instance, if your area is vibrant and growing because new businesses are flowing in, there will be plenty of buyer demand that will ultimately raise home prices over time. Of course, the opposite side of that coin is true too. Examine unemployment rates, average salaries, and future job growth. If the news is positive, your chances of selling at a competitive price is likely. As a homeowner, you probably already know what the crime is like in your area and how schools rank. As an informed seller though, you need to be aware that buyers are doing more real estate research than they did 20 years ago. Buyers will want to be assured that their new investment will be safe and that the area attracts new buyers in the future. At least knowing what’s going on in your area is better than if the results are less than positive. Buyers are likely to check into crime rates on their own so knowing that information yourself may offset their concerns. Why? Well, there might be a particular reason that you understand better than some mathematical list of percentages. Here’s a good example. In one of our growing cities, violent crime and larceny are real low but petty theft was a little high. Well, the reason for that is that this city is the largest shopping hub in the county and we have millions of tourists who visit us on a yearly basis. Knowing this information may make the buyers comfortable enough to write an offer. Be an informed seller. As far as schools go, how well they are ranked is important whether your kids are still at home or not. Even if your kids are grown and gone, a large number of buyers do have kids at home and schools will be important. Studies have shown that millennials are the largest purchasing group in the country now for real estate and they are the ripe age for having children. So, be aware of how schools stand up in your area so you’ll be able to highlight that fact if they are worthy. GreatSchools.org is a great school ranking site. How Long Are Homes Staying on the Market? The time that properties sit on the MLS is a major indicator of the pulse of the real estate market. In our area that time reflects the days that a home is for sale until it goes “under contract” not closing day. From the day a home goes under contract, there is usually a 30 – 45 day period before closing. During this time the title work, mortgage loan process, inspections, and contingencies will be completed. There really isn’t any better way to find out the Days on the Market without the help of a Realtor. 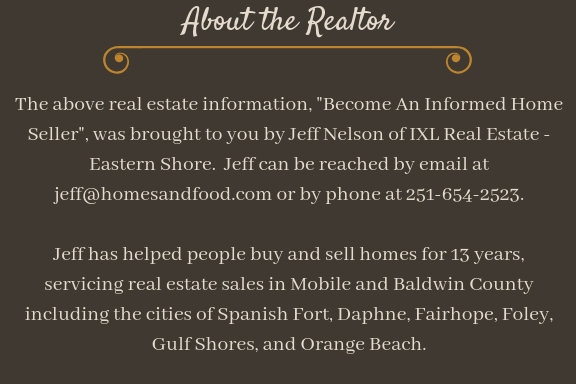 You really need this information to be an informed seller so you know what to expect with your own property. All we have to go on is history for price and time. So, get with your Realtor to find out what the average Days on the Market are for current homes for sale and those that have recently sold. If the average is 90 days to get a house under contract, there are some homes that don’t sell at all, some that go under contract in 120 days and some that come off the market on 1 day. You and your Realtor’s goal is to find out what attracts buyers the fastest. It usually comes down to price, condition, and location. Are You in a Buyer’s Market Or Seller’s Market? So how big is your competition? How many homes are for sale in your local area and similar to yours? 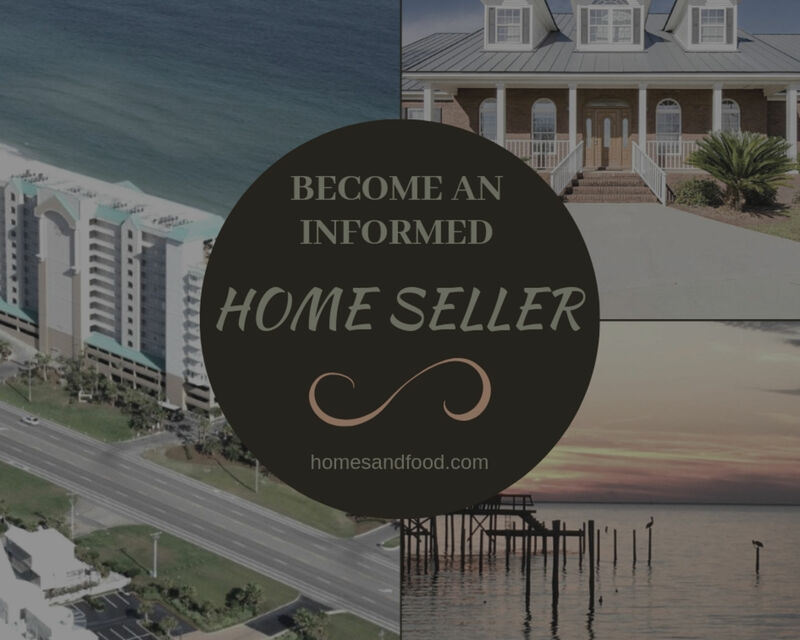 This information will help you become a more informed seller because you will know if you’re in a buyer’s market or seller’s market. A buyer’s market occurs when there are more homes for sale than buyers, giving the advantage to the buyer. Selling prices are often lower than the original list price. A seller’s market occurs when there are more buyers than listings. Buyers often find themselves in a situation with multiple offers driving prices over the original list price. While finding the actual number of homes for sale is one way to analyze your competition, another is to gauge inventory in months. Huh? Here’s an explanation…. It all has to do with supply and demand. A market is said to be balanced when there is 6 months worth of inventory, meaning it would take 6 months to sell every home that is currently on the market. Inventory that is less than 6 months indicates a seller’s market and if the inventory is more than 6 months you’re in a buyer’s market. Be informed about real estate conditions so you know how to price and what to expect. One of the basic but very important ways to gauge home prices in an area is to look at the home’s price per square foot. You simply take the list price or selling price and divide that number by the homes total square feet. For example, a 2,000 square foot home selling at $200,000 sold at $100 per square foot. For neighborhoods with very similar homes or condo communities, coming up with a good price per square foot to use for establishing a list price is fairly easy. Buyers today are more educated than ever before. Many of them not only want to know how long a home has been on the market but also what the average price per foot is. So, red flags will go up if homes around you are priced at an average of $125 per foot and yours is priced at $150 per foot. With such a big difference, you should have a good reason for it and be able to highlight those reasons to buyers. A good Realtor will be able to do this for you and will not have to be asked to do so. Most people make big decisions in life for hope of gain or fear of loss and mortgage interest rates definitely fall into that category. We usually see an uptick in sales when rates fall to historic lows but more so as rates move up to uncomfortable levels. A 1% interest rate hike could mean paying hundreds of dollars extra a month, vastly changing how much of a house that you can afford. Become a more informed home seller by keeping an eye on current mortgage rates and forecasts for future rises and falls. Although none of us have a crystal ball, if you hear from multiple sources that interest rates are likely to increase over the next year, you may want to list your home now. Your pool of buyers will be larger because there will be more who can afford buying a home at your price point. Seller closing costs that include title preparation, taxes, and Realtor fees. Not all of the costs above are “out of pocket” before closing or even necessary at all. Just know that you will have to cover all of the areas in this article to realize the best possible scenario for your sale. Working with a seasoned Realtor will help offset your frustration and be extremely helpful for informing you through the whole process. Every once in awhile (about 7% of all home sales) sellers feel like going through this on their own but later realize that they should have used an agent. The fee paid to a Realtor to sell your home will more than likely net you more money and less time. A Realtor will already know the current real estate market conditions, has expertise in staging, and will pay money out of their pocket for marketing/advertising. Sometimes we want to sell our home and sometimes we are forced to sell with our job. In any case, how much money you realize at the closing table will have everything to do with your current market and the condition of your property.